RaNia's Alex confirms she's the new leader of RaNia. Discussion in 'K-POP' started by ychofficial, Aug 14, 2016.
emily1 and its_zo like this. Man, who cares who's the leader of a particular girl group is? Why do you people care so much? VIXXs_Noona, emily1, Envyy and 5 others like this. LOL why is Alex the leader? That makes no sense. she look like foreign , where she from ! 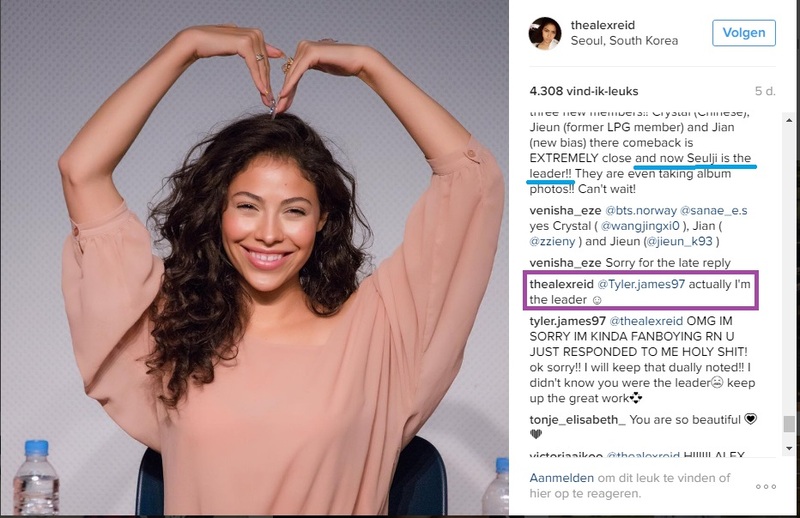 She's from the US and not Korean. Aren't they coming back somewhere in August? So far I can say nothing will help Rania to break big, not even an exotic foreign member. Even YG help during Style era didn't help them. I hope they'll disband after this and move on because girls deserve better. So Rania is now the three girls who were there for one single + new members? I kind of wish they could just rebrand themselves at this point. They're a completely different group than what we started with. Hahahhaha, she's been in Kpop all of 2 seconds and absolutely hates how things work/are run. She's gonna be a great leader, espeeeeecially considering it seems she's never actually with the group. I like her enough but I just don't see how this is gonna work out with all new members. Actually a good leader if she/he takes his role seriously can make a group go far! Is she really? I'm honestly surprised. That's.. Cool, Good luck to her! Group leaders "may not do much", but in the past they were the ones to take care of the other members, be a mediator if there was a problem & represent the group in various ways. They generally were the first ones to speak on behalf of the group when on interviews or making a speech so.. I think there's still some significance to being a leader. Well, I at least hope she's learned more Korean. VIXXs_Noona and seesaw4ever like this. nami_chan, VIXXs_Noona, MakkieSone and 5 others like this. I wish they chose someone else like Seulji because while I love Alex, it'd be hard for her to communicate with her members and people on shows due to the language barrier. Leaders are always the ones that people like show MCs look at when they ask the group to say something about their expefience on the show like on Weekly Idol. Unless she improved a lot in Korean recently I think it'd be hard for her. I have to say that Alex didn't know how to speak Korean! Why she's the leader? While I think she would probably do well as a leader in any other situation I don't think she should be the leader since she can barely speak Korean. Leaders play a big role in variety shows and if there is a language barrier I don't think they will grow. Hyemi has been in the group the longest...why isn't she the leader? Then again, they made Semi the leader, when she was in the group the least amount of time in her line up.